"Archimedes" Als Spiel- Lehr- und Lernmittel | the divisible apple to learn the calculation of fractions. --- Rudolf Loebelenze, Stuttgart. 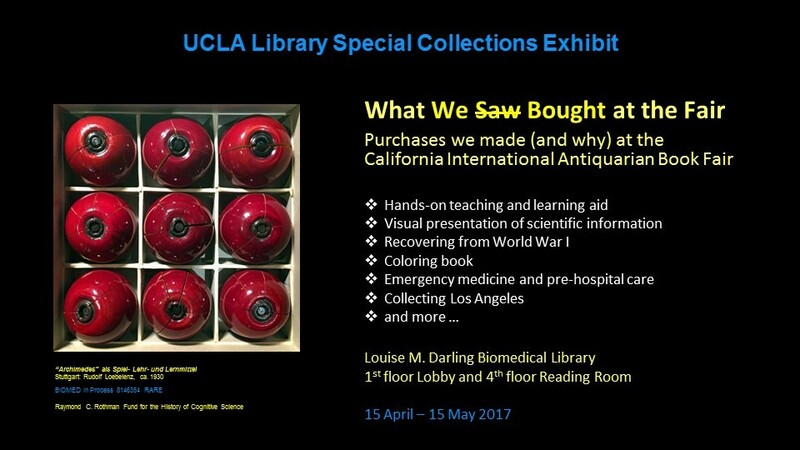 Announcing a new exhibit at History & Special Collections for the Sciences, a component of UCLA Library Special Collections located at the Louise M. Darling Biomedical Library ("Biomed"). An unusual feature of the "This Just In/Recent Acquisitions"-themed display: each item is accompanied by a "Why We Bought It" explanation which calls on our collection development policies and strategies. The "Archimedes" item alone (pictured above) is worth the trek to Biomed, 12-077 Center for Health Sciences. Not quite the original Apple "computer," it still resounds as a clever teaching tool with lovely craftsmanship. Purchases we made (and why) at the California International Antiquarian Book Fair.